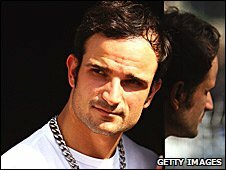 Force India have named reserve driver Vitantonio Liuzzi as Giancarlo Fisichella's replacement for the final five races of the 2009 season. The 28-year-old Italian will make his Force India debut at his home grand prix in Monza this weekend following Fisichella's switch to Ferrari. "This is my opportunity to show people what I can do and I'm looking forward to it," said Liuzzi. Liuzzi began his career at Red Bull but last raced in 2007 for Toro Rosso. After joining Force India as reserve driver in 2008 he will get back behind the wheel following Fisichella's move to Ferrari to stand in for the injured Felipe Massa. Liuzzi geared up for his return to competitive racing by taking part in a straight line test in the 2009 specification car in Gloucestershire last week. "I can't wait to get back in the car in race trim," he added. "I really appreciate the opportunity [Force India boss] Vijay Mallya has given me. "I'm very motivated, I'm in good shape and hungry to get some more points on the board." Fisichella signed off for Force India by collecting the team's first points with an impressive second place at the Belgian Grand Prix after starting on pole. Force India have steadily improved their performance over the last few races and could benefit again from Monza's low-downforce track. Mallya now hopes Liuzzi, whose career-best finish was sixth at the 2007 Chinese GP, can help team-mate Adrian Sutil carry forward the team's good form. "Force India is now in a very competitive position and we need a driver who can continue this momentum," Mallya said. "This will be the chance for Tonio to demonstrate to both the team and the field that he has the commitment, speed and professionalism to perform and I am sure he will seize the opportunity." Liuzzi began his F1 career at Red Bull in 2005 but, in an unusual arrangement, he shared the seat with Christian Klien and only competed in four races. He moved to Red Bull's sister team, Toro Rosso, in 2006, where he scored the team's first points at Indianapolis, before joining Force India in 2008.